An antique photo, from an antique camera, from an antique, that’s this week’s offering for the Rule Of Thirds Challenge. The camera is circa 2005. That’s how old it is, exact historical dates are unavailable so the word circa is allowed. The camera, a Kodak Z7590 5mp, got average reviews back in the day. Surprisingly people still sell them, generally asking about $50. I’m not sure anyone actually buys them. The photo is a 2009 vintage, straight out of the camera – no HDR applied (if anyone was even wondering). 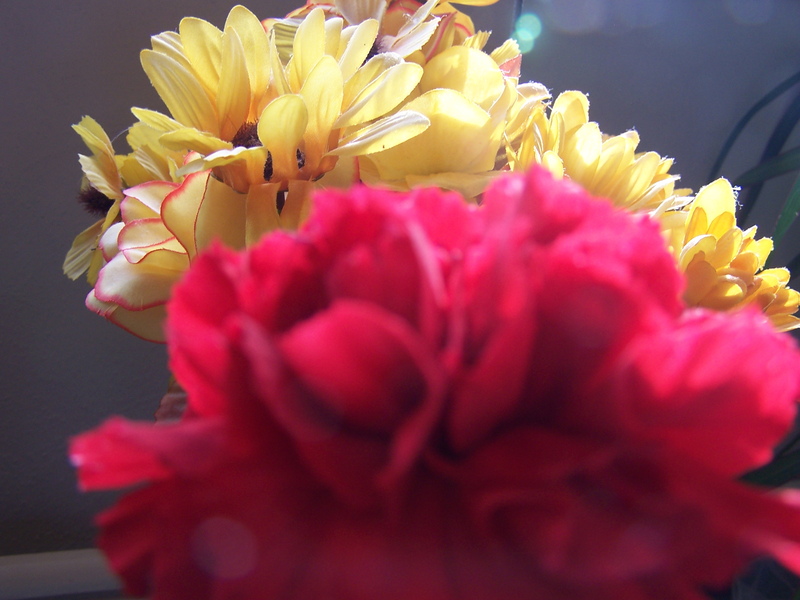 Fabric flowers (sounds much better than cloth flowers) on a table by a window. The camera has a “macro” mode, which probably helped significantly. f/2.8, at 1/60 at ISO 80 – heck my new expensive camera doesn’t even have a creative ISO 80 available. Does the photo meet the challenge rules? It all depends on what “thirds” means. I’d say that about 1/3 of the photo contains nonessential stuff. I’ll count that one. The yellow flower is roughly in the top third and left third of the photo – if we ignore the other yellow stuff trailing off to the right. I’ll count both of those as meeting the rule. I hope we don’t have to take away thirds for the big pink thing in the middle? And bokeh? There’s a little bit in the top right corner helped considerably from the light coming through the window and the ample amount of dust in the room. Or is that lens flare? Bokeh-flare! I’m also counting as bokeh the stuff running across the very bottom, even though I’m pretty sure it was caused by a peanut butter smear on the lens (it was lunch time). If I was going to edit the photo, I might crop the right side and bottom a bit, where the green plant leaves intrude into the picture on the right and the baseboard at the bottom. But then I’d have to recalculate all my thirds. Saved for another day. I was never good at rules. This entry was posted on 02/21/2015 at 13:02 and is filed under Photos. You can follow any responses to this entry through the RSS 2.0 feed. You can leave a response, or trackback from your own site.